EUR has been empowered by the economic reports in Eurozone and the US will publish Beige Book, Crude Oil Inventories, Housing Starts and Building Permits. 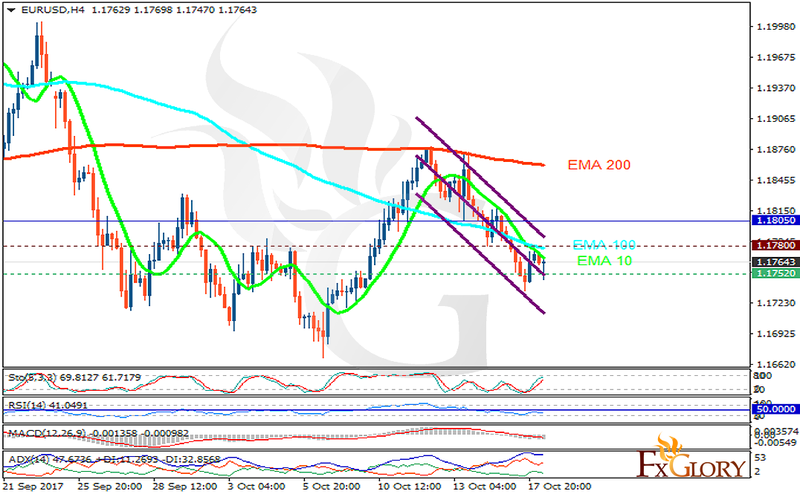 The support rests at 1.17520 with resistance at 1.17800 which both lines are below the weekly pivot point at 1.18050. The EMA of 10 is moving with bearish bias along the descendant channel and it is below the EMA of 200 and the EMA of 100. The RSI is falling towards the oversold area, the Stochastic is showing upward momentum and the MACD indicator is in negative territory. The ADX is showing sell signals. It seems that EURUSD has started its correction pattern towards 1.19 area while noting that pullbacks can reach towards 1.173.